In the 1940s a poignant chapter in North Carolina labor union and civil rights history was written in Winston-Salem, where 10,000 tobacco manufacturing workers, the majority of them African American, used their union to challenge the severe racial discrimination, economic injustice, and political oppression that they experienced as employees of the massive R. J. Reynolds Tobacco Company and as citizens of the city. Operating through Local 22 of the Food, Tobacco, Agricultural, and Allied Workers-Congress of Industrial Organizations (FTA- CIO), these workers, many of them women, fought not only for fair labor conditions but also for civil rights legislation and increased control of their social and political lives, registering thousands of African American voters and in the process revitalizing the local moribund chapter of the National Association for the Advancement of Colored People. Although many of their efforts ultimately failed, the blending of unionist and civil rights objectives attracted national and international attention and raised awareness of the acute racial inequities and flawed democratic system so prevalent in the mid-twentieth-century South. In May 1946 the CIO launched a drive in the South known as "Operation Dixie." Its purpose was to preserve the gains made by organized labor in the previous decade and, more important, to protect its members from the textile industry's tendency to leave organized regions such as New England and the Midwest for locations in the traditionally nonunionized South. The organizing strategy of Operation Dixie called for a major campaign by the TWUA, since the textile industry was the region's largest industrial employer, with a special effort in North Carolina as the leading textile-manufacturing state. From its headquarters in Atlanta, the TWUA dispatched teams of organizers to the Carolinas, Georgia, Alabama, and Virginia. It became immediately clear, however, that southerners were not prepared to accept the CIO concept of "one big union" of industrial workers. The effort to unionize southern textile plants failed for several reasons. A postwar mood of conservatism marked by fears of worldwide communism dampened the enthusiasm for collective action. Opposition from the AFL and factionalism within the CIO itself further undermined Operation Dixie. Finally, the unique political and social culture of management and labor relations in the South proved a powerful obstacle to traditional appeals by organizers for class solidarity. Operation Dixie officially ended in 1953. Defeat in the bellwether textile industry proved a devastating, though not fatal, blow to the CIO and TWUA. In November 1958 the TWUA called a strike against North Carolina's Harriet and Henderson mills when the company refused to sign a new contract. The strike became violent with rock throwing, vandalism, shootings, and bombings after the company tried to hire new workers to replace the strikers. Governor Luther H. Hodges attempted to intervene without success and called up the state police and National Guard to protect the mills and their new employees. The mills resumed operations, and by May 1959 the workforce was at full complement. The defeat of the Harriet-Henderson strike did not lessen the determination of union leaders to gain recognition by the textile industry and to negotiate for rank-and-file workers. In the 1960s and 1970s the TWUA conducted a major campaign to organize workers at the J. P. Stevens Company plants in Roanoke Rapids. After a decade of organizing and litigating, the TWUA scored a victory in 1974 by carrying 54 percent of more than 3,000 votes cast by workers in Roanoke Rapids. The vote reflected the impact of black workers, who by that time represented 30 to 40 percent of the workforce. In June 1976 the TWUA merged with the Amalgamated Clothing Workers Union to form the Amalgamated Clothing and Textile Workers Union (ACTWU), thus creating a major new labor organization with half a million members. The ACTWU's efforts against J. P. Stevens gained international attention with the 1979 release of the film Norma Rae, starring Sally Field, which was based in part on the true-life experiences of Crystal Lee Sutton, a Roanoke Rapids textile worker who was fired by J. P. Stevens for her organizing activities. Operation Dixie [microform] : the C.I.O. Organizing Committee papers, 1946-1953. Published: [Sanford, N.C.] : Microfilming Corp. of America, 1980. NCSU Libraries: http://catalog.lib.ncsu.edu/record/NCSU778059. 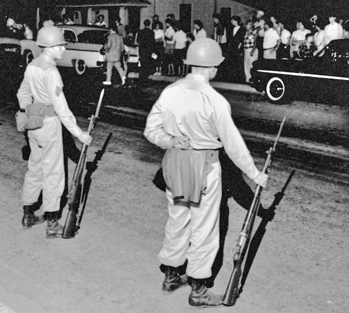 National Guardsmen face off with townspeople in Henderson after being mobilized by Governor Luther Hodges during the Harriet-Henderson Mills strike in May 1959. Courtesy of North Carolina Office of Archives and History, Raleigh. The Raleigh News and Observer files.